I'm appalled that Totimoshi is not a well known name. They push the exterior bounds of rock and metal with only the basics: a voice, a guitar, a bass, and a drum kit. Wait a second, maybe this is what progressive metal really is (and this is coming from me, a huge proponent of evolution of music)? This melting pot, known as Totimoshi, has a list of fantastic influences that never override and define their sound. They are quite simply, and perfectly, Totimoshi, and their latest album "Avenger" is the type that can save our ears from the dumbed down, mundane sounds that have taken over the radio waves. "Avenger" is chock full of solid rock and metal. For me, the first three quarters of this album is a builder, effortlessly preparing us listeners to enjoy the sheer brilliance that awaits. The intro track "Intro" is really just a 15 second filler involving a sinister laugh and some inaudible sounds. This haunting filler actually compliments our title track and its raucous tones. "The Fool" breathes life into dying rock and roll giving us hooks, catchy grooves, and laudable background vocalizing. "Opus" begins the monumental launch to the remainder of the album. A subtle guitar tone becomes a fierce rhythmic pattern which feels so much bigger than its four minute run time. I guess "Opus" is the perfect title for such a song. "Leaves" and "Snag" both start out mellow only to grow barbaric and intense. I also find the guitar solo in "Snag" to be remarkable, very Gilmour-esque, letting the roots of a powerful influence shine through. The onset of "Waning Divine" acknowledges Totimoshi's flexible writing and orchestration. The track absolutely stands out amongst the rest of the album. A seasoned fan of the genre would not have to read the album notes to know that Scott Kelly [Neurosis] and Brent Hinds [Mastodon] were at work with Totimoshi here. "Waning Divine" is heavy. Enjoy it. Totimoshi has delivered a taste of every genre on this inventive and versatile record. In a recent interview** Tony, guitar and vocals, says, "...Avenger will make you believe in rock and roll again" as well as "We made it in 48 hours on no budget! Imagine that." 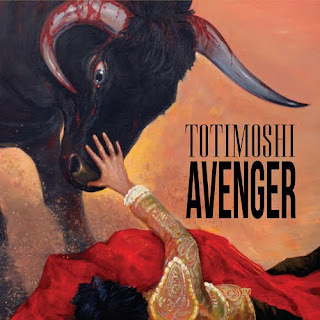 Mr. Aguilar, my hope was fading in rock and roll, but thanks to the likes of you, a few others out there, and of course Totimoshi's "Avenger" I know we will live to see another day. Phenomenal work! 9 out of 10. You can expect to see this on the "Best of 2011" list. It seems like I downloaded this album ages ago.....and then, forgot to listen to it. Thanks for the reminder, I completely switched modes and am now rocking it. Looking forward to getting to the Gilmour-esque solo! Sweet review.